After that it was the David Freese deal – in which Reliever Fernando Salas came with him from the NL champion St. Louis Cardinals for Randal Grichuk and Peter Bourjos. He dealt Frieri (who had a great deal of Team control ability) away for the last year of Jason Grilli. This was a risk because the former Pirates Closer hasn’t looked like his vintage 2013 self at this point in the campaign, but he worked out just fine for the Halo’s. A few weeks later, Joe Thatcher was brought to Los Angeles for former 11th and 12th RD Draft Picks. While Thatcher hasn’t fared well as of yet, he has a proven track record, and has been on the DL with a sprained ankle. Bringing the lefty in comes without much risk, and he should be able to help them in the final couple of weeks of the year, and namely the playoffs. 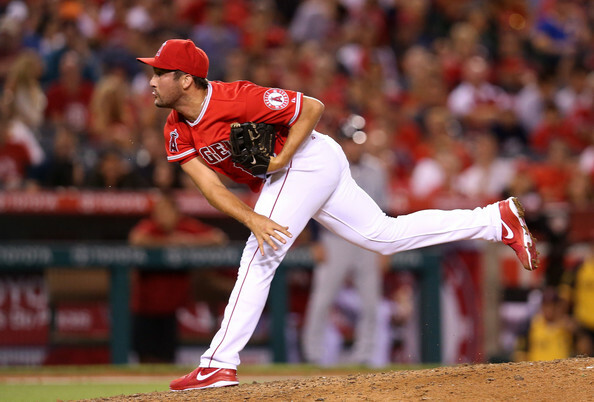 The last card to fall was trading for proven Closer Huston Street. The man hadn’t yielded a run in his time with Los Angeles until yesterdays defeat to the Rangers. Street still has registered 9 Saves in 10 chances – while holding just a 1.50 ERA and 1.000 WHIP thus far in 12 IP. His career ERA in the AL is just 2.82. The best part about this guy is that he is also signed for next year (the team will surely pick up his 2015 Team Option of $7 MIL. Kevin Jepsen and Mike Morin represent the Relief Core of guys drafted from within. Jepsen is night and day away from his 2013 campaign where he featured a 4.50 ERA, as he his operating at a 2.09 mark this season, and leads the league in Appearances with 60. The squad actually sent down Michael Kohn this year, despite him having a decent ERA of just over 3 in the Majors through May. Cory Rasmus was acquired last year for former bullpen arm Scott Downs ( who was signed to a 3 year deal with Halo’s). The younger players has outperformed Downs this year quite handily. The Starting Rotation is also in a lot better shape. 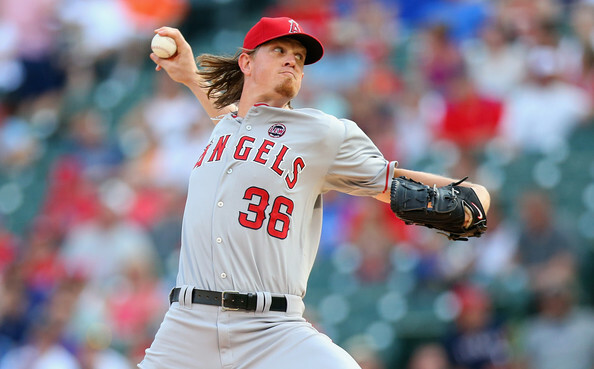 Jered Weaver is as solid as ever. If you don’t believe me, check out the fact he is the active win percentage leader in the MLB. You can’t be a pedestrian chucker and own this honor. Garrett Richards is another club draft selection. Tyler Skaggs was to before the team traded him away for Dan Haren, (who failed expectations in Orange County for sure. At least you were able to re-acquire Skaggs in the Mark Trumbo deal, as the big RHB/DH has been notably replaced by C.J. Cron and Kole Calhoun. It is too bad that Skaggs went out for the year with Tommy John Surgery. Matt Shoemaker has stepped up in the Rotation admirably to fill the void left by Hector Santiago 1st, then Skaggs. Shoemaker was also drafted by the squad. Speaking of Hector Santiago, he was part of the 3 way trade too with Arizona and the Chicago White Sox. So far, all of these 6 starters have made all 122 team starts, giving the club a major league leading .590 Win Percentage. As far as the players gone from this Roster Tree of Pitchers, none should burn the franchise. Patrick Corbin is out with TJ Surgery like Skaggs, and Mark Trumbo has been hurt the majority of the year. Yest Trumbo still has 2 years left of team control, however there was no spot for him with Josh Hamilton, Albert Pujols, Cron and Calhoun all eating up spots. There about 9 Minor League players that have been traded for some of these guys. but none are can’t miss prospects. The Padres receiving 4 of these said players might come back later to bite them, but that is a cost of doing business. The Angels are stacked to win right now, with Hamilton and Pujols not becoming younger, and with Mike Trout in his full prime. You also have a nice secondary cast of inexpensive entry-level players and quality veterans performing to their own deals. At least for this year so far, the team that was once envisioned by the current brass, is fulfilling its talent base. Dipoto has come a long way in the last 8 months as a GM. Garrett Richards (5/27/88) SP; Drafted by the Los Angeles Angels of Anaheim in the 1st round (42nd pick) of the 2009 amateur draft. Jered Weaver (10/4/82) SP: Drafted by the Anaheim Angels in the 1st round (12th pick) of the 2004 amateur draft. C.J. Wilson (11/18/80) SP; December 8, 2011: Signed as a Free Agent with the Los Angeles Angels of Anaheim. 5 YRs/$77.5 MIL. Tyler Skaggs (7/13/91) SP: December 10, 2013: Traded as part of a 3-team trade by the Arizona Diamondbacks to the Los Angeles Angels of Anaheim. The Chicago White Sox sent Hector Santiago to the Los Angeles Angels of Anaheim. The Chicago White Sox sent a player to be named later to the Arizona Diamondbacks. The Los Angeles Angels of Anaheim sent a player to be named later and Mark Trumbo to the Arizona Diamondbacks. The Arizona Diamondbacks sent Adam Eaton to the Chicago White Sox. The Los Angeles Angels of Anaheim sent A.J. Schugel (minors) (December 13, 2013) to the Arizona Diamondbacks to complete the trade. The Chicago White Sox sent Brandon Jacobs (minors) (December 13, 2013) to the Arizona Diamondbacks to complete the trade. Mark Trumbo (1/16/86) OF/1B/DH: Drafted by the Anaheim Angels in the 18th round of the 2004 amateur draft. Hector Santiago (12/16/87) SP: Is with the rotation in 2014. August 7, 2010: the Los Angeles Angels of Anaheim sent Tyler Skaggs to the Arizona Diamondbacks to complete an earlier deal made on July 25, 2010. July 25, 2010: The Los Angeles Angels of Anaheim sent a player to be named later, Patrick Corbin, Rafael Rodriguez and Joe Saunders to the Arizona Diamondbacks for Dan Haren. Dan Haren (9/17/80) SP; November 2, 2012: Granted Free Agency. Joe Saunders (6/16/81) SP: Drafted by the Anaheim Angels in the 1st round (12th pick) of the 2002 amateur draft. Patrick Corbin (7/19/89) SP: Drafted by the Los Angeles Angels of Anaheim in the 2nd round of the 2009 amateur draft. Rafael Rodriguez (9/14/84) P: Signed by the Anaheim Angels as an amateur free agent in 2001. Matt Shoemaker (9/27/86) SP: Signed by the Los Angeles Angels of Anaheim as an amateur free agent in 2008. Joe Smith (3/22/84) RP: November 27, 2013: Signed as a Free Agent with the Los Angeles Angels of Anaheim. 3 YRs/$15.75 MIL. Kevin Jepsen (7/26/84) RP: Drafted by the Anaheim Angels in the 2nd round of the 2002 amateur draft. Mike Morin (5/3/91) RP: Drafted by the Los Angeles Angels of Anaheim in the 13th round of the 2012 amateur draft. Jason Grilli (11/11/76) RP: June 27, 2014: Traded by the Pittsburgh Pirates to the Los Angeles Angels of Anaheim for Ernesto Frieri. 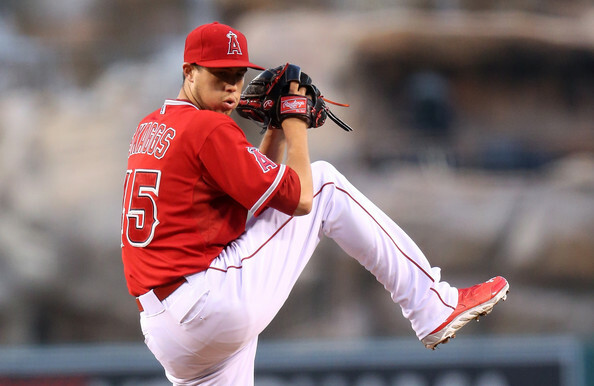 Ernesto Frieri (7/19/85) RP: May 3, 2012: Traded by the San Diego Padres to the Los Angeles Angels of Anaheim for Alexi Amarista and Donn Roach. Alexi Amarista (4/6/89) OF/2B/3B: Signed by the Los Angeles Angels of Anaheim as an amateur free agent in 2007. Donn Roach (12/14/89) RP: Drafted by the Los Angeles Angels of Anaheim in the 3rd round of the 2010 amateur draft. Fernando Salas (5/30/85) RP: November 22, 2013: Traded by the St. Louis Cardinals with David Freese to the Los Angeles Angels of Anaheim for Peter Bourjos and Randal Grichuk. David Freese (4/28/83) 3B: Is with the team’s offensive lineup for the 2014 season. Peter Bourjos (3/31/87) OF: Drafted by the Los Angeles Angels of Anaheim in the 10th round of the 2005 amateur draft. Randal Grichuk (8/13/91) OF/PH: Drafted by the Los Angeles Angels of Anaheim in the 1st round (24th pick) of the 2009 amateur draft. Huston Street (8/2/83) CL: July 19, 2014: Traded by the San Diego Padres with Trevor Gott (minors) to the Los Angeles Angels of Anaheim for R.J. Alvarez (minors), Taylor Lindsey (minors), Elliot Morris (minors) and Jose Rondon (minors). Trevor Gott (8/26/92) RP: Is currently pitching with AA affiliate Arkansas. Jose Rondon (3/3/94) SS/3B: Signed as an International Free Agent in 2010. Joe Thatcher (10/4/81) RP: July 5, 2014: Traded by the Arizona Diamondbacks with Tony Campana to the Los Angeles Angels of Anaheim for Zach Borenstein (minors) and Joey Krehbiel (minors). Tony Campana (5/30/86) OF: Is currently in Salt Lake City playing for the Bees (PCL, AAA Affiliate). Zach Borenstein (7/23/90) P: Drafted by the Los Angeles Angels of Anaheim in the 23rd round of the 2011 MLB June Amateur Draft. Joey Krehbiel (12/20/92) RP: Drafted by the Los Angeles Angels of Anaheim in the 12th round of the 2011 MLB June Amateur Draft. Michael Kohn (6/36/86) RP: Drafted by the Los Angeles Angels of Anaheim in the 13th round of the 2008 amateur draft. Cory Rasmus (11/6/87) RP: July 29, 2013: Traded by the Atlanta Braves to the Los Angeles Angels of Anaheim for Scott Downs. Scott Downs (3/17/76) RP: December 10, 2010: Signed as a Free Agent with the Los Angeles Angels of Anaheim. 3 YRs/$15 MIL. Cam Bedrosian (10/2/91) RP: Drafted by the Los Angeles Angels of Anaheim in the 1st round (29th pick) of the 2010 amateur draft. Posted on August 18, 2014, in MLB Roster Trees and tagged a.j. schugel, AL West, alexi amarista, Angel Stadium, Arizona Diamonbacks, arte moreno, Brandon Jacobs, c.j. cron, c.j. wilson, cam bedrosian, cc sabathia, chicago white sox, clayton kershaw, Cory Rasmus, dan haren, david freese, david price, Donn Roach, Elliot Morris, ernetsto frieri, fernando salas, garrett richards, hector santiago, jason grilli, jered weaver, jerry dipoto, joe blanton, joe saunders, Joe Smith, joe thatcher, joey krehbiel, johan santana, jon lester, jose rondon, justin verlander, kevin jepsen, kole calhoun, los angeles angels pitchers 2014, mark trumbo, Matt Shoemaker, max scherzer, michael kohn, Mike Morin, mike scioscia, Mike Trout, Patrick Corbin, peter bourjos, pittsburgh pirates, R.J. Alvarez, Rafael Rodriguez, randal grichuck, Salt Lake Bees (PCL), san diego padres, scott downs, sean burnett, Taylor Lindsey, tim hudson, tony campanana, tyler gott, tyler skaggs, zach borenstein. Bookmark the permalink. Leave a comment.